Imagine replacing your all-in-one with a printer that’s smaller, quieter and is infinitely easier on the eyes. Best of all, it offers professional-quality colour. 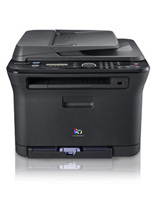 The CLX-3175FW features 17 ppm black/4 ppm colour print speed, 2400 x 600 dpi effective output, 802.11 g wireless network, manual duplexing and colour faxing. And all of this productivity is housed in an elegantly designed form, finished in an elegant matte black. Small. Powerful. Elegant. There’s efficiency in these numbers. Letter-size print and copy speeds are a swift 17 ppm for monochrome and 4 ppm for colour. Plus, the CLX-3175FW offers print resolution up to 2,400 x 600 dpi effective output and enhanced scanning resolution of 4,800 x 4,800 dpi. Its integrated fax scans at 3 seconds per page with a 4 MB memory. That’s impressive! The CLX-3175FW is big - and small - on copy features. It offers reduce/enlarge capabilities from 25 to 400 percent, as well as two-up and four-up copying, poster copying and clone copy. It even has an ID card copy function, so both sides can be copied and printed on one sheet quickly and easily. Toner changes couldn’t be faster - or easier. The mini toner cartridges are small enough to fit in your hand, making them easier to handle than bulky cartridges. Open the cover, pop out the old toner, pop in the new, and you’re ready to go. The CLX-3175FW is built with SAMSUNG’s exclusive NO-NOIS print engine. Unlike traditional printers, the toner cartridges are fixed securely in place, so it prints with just a whisper. CLX-3175FW supports 802.11 g wireless network connection. USB means the ultimate in simplicity and versatility. Print quickly - without using a PC - by connecting any PictBridge™ camera or phone directly to the printer. You can also connect USB memory to the printer and print instantly. Even when you don’t have access to a PC, you can save what you scanned directly to a USB memory.